Mary Arden’s farm was the childhood home of Shakespeare’s mother. The attraction is on a large plot just outside Stratford upon Avon and there are lots of things to see on your visit. It’s not only a Shakespeare related location, but also a proper working Tudor farm. As such, much of what you see is about how farming was conducted in that era. Costumed residents are on hand to help you get a feel for the place, along with pigs, goats, sheep and cattle. There are quite a few buildings to see around the complex including Mary Arden’s house, many barns and outbuildings and the farmhouse of the Palmer family. In the summer months, there are many organised activities and displays. For instance, at weekends you’ll often find a birds of prey demonstration and there’s Tudor entertainment on occasions too. We enjoyed the extra dimension that the farm adds to the collection of properties connected with Shakespeare. It’s the Shakespeare property that young children will get the most out of, but it’s certainly not just for families. We visited without our children and enjoyed it very much. It meant we were able to focus on the historical aspects better. Basic adult admission to Mary Arden’s Farm is £9.50, but you can also get a combined ticket for all five Shakespeare properties. 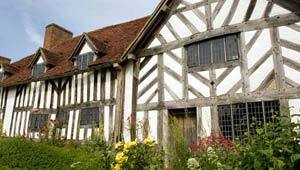 The other buildings operated by the Shakespeare Birthplace Trust are the Birthplace itself, Anne Hathaway’s Cottage, Nash’s House including the remains of Shakespeare’s new house and Hall’s Croft. Booking online in advance can save you money! Also, tickets are valid for 12 months from the date of issue to allow you to return for free. Mary Arden’s Farm is open between March and October daily from 10am to 5pm but it is closed in the winter months.. The farm is the village of Wilmcote, a short drive from Stratford. The Hop-on, Hop-off Bus Tour also stops here.